We expect fitness enthusiasts from far and wide to attend this event. If you're from outside Nova Scotia, visit our Hotel and Travel page for information on where to stay and things to see and do while you're here. He’s created international best-selling fitness programs, shared the stage with Adam Lambert and Val Kilmer, landed roles on TV shows and movies like Six Feet Under and Beauty Shop and danced with Mariah Carey. He choreographed for USTA’s Arthur Ashe Kids Day, the NCAA Final Four Halftime Show and the movie Bring it on: All or Nothing. 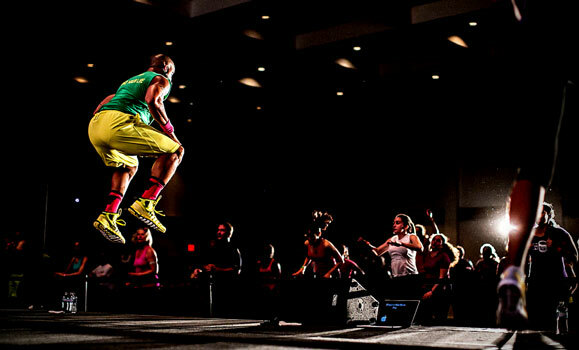 Now, world-renowned health and fitness expert Shaun T is coming to Halifax! For the first time ever, Shaun T will bring his transformative and inspiring fitness experience here as part of Dalhousie’s 200th anniversary celebrations. On September 22, 2018, the Faculty of Health will host Shaun T for a huge community workout and motivational talk at the Halifax Convention Centre. It’ll be Shaun T’s first ever visit to Canada’s East Coast. Forty lucky VIP Backstage Pass holders will also have an exclusive opportunity to meet Shaun T and have their photo taken with him! An inspiring motivator and creator of best-selling fitness programs INSANITY, HIP HOP ABS, FOCUS T25, CIZE and more, Shaun T’s engaging and motivating presence inspires others with the confidence they need to live life at their best. His personal motto is Trust and Believe, and he expertly addresses both the mental and physical aspects of health and fitness. He is currently on a global tour for his new book T Is for Transformation. This will be a T25/Insanity Max/Insane Focus inspired workout, with dedicated modifier on stage for low impact/lower intensity options. HITT/cardio/body weight strength training. After the workout, Shaun T will motivate you with a talk focused on the physical and mental aspects of building a healthy lifestyle, with input on the power of nutrition and building your personal “health-minded” community/inner circle. There will also be a Q&A session where Shaun T will take questions from the crowd; this can be a personal, fitness, health question - anything they’d like! After the community workout, VIP ticket holders will have a more “personal” experience, with the opportunity for autographs from Shaun T and photographs! We will also be hosting an exciting fitness expo featuring the latest in mental and physical wellness. Come and work out with Shaun T, hear his motivational talk, then stay and browse the expo featuring local fitness vendors and experts from Dal and beyond showcasing a broad range of topics — from athletics to recreation and rehabilitation. The Faculty of Health is hosting the Shaun T community workout as one of our key Dalhousie 200th celebrations. One of the goals for this not-for-profit event is to help deserving students meet their educational goals. Any profits from the Shaun T event will be directed to our new PhD in Health Scholarship. Business and community organizations can take part in this exciting event! Contact us to discuss customized partnership opportunities.